On the 14th of January 2015 Marvel released their first Star Wars comic since the takeover from Dark Horse comics at the end of 2014, and it’s a solid start to say the least. To be honest I’ve never been a huge comic book collector, and in the past I would only pick up comic’s that featured Boba Fett and other bounty hunter tales. This is not to say I never liked them, I just never got too grips with the different levels of canon and preferred to stick with what was known as ‘A’ level canon. However since the Disney’s acquisition of the various Star Wars licenses, and the decision to create one cohesive canon, it makes overly excited to know each and every part. The comic open’s in classic Star Wars fashion, with the large title and iconic scroll we all know and love so much. This immediately had an impact on me and I was instantly immersed into the galaxy far far away. The opening page then shows the classic image of a ship coming in from out of shot, as if from above our heads, another beautiful reminder of the universe we are in. The vessel appearing on the opening pages is a Tatooine shuttle, very reminiscent of Jabba’s sail barge from Return of the Jedi. This shuttle is in fact carrying our heroes, Han, Luke and Leia, our heroes are on a mission to disrupt the largest imperial weapon’s factory in the galaxy. With our heroes now cleared for landing on Cymoon 1, and the Falcon hidden away in a junk field with none other than C-3PO at its helm, their chances of success edge slightly closer. Han is the first of our heroes with dialogue, and writer Jason Aaron has done a tremendous job in bringing back the cocky space smuggler we all remember to well. In the exchange between Han and imperial Overseer Aggadeen, you are really reminded of Han’s comfortable arrogance, the combination of great dialogue and brilliant artwork by John Cassady bring’s Han Solo back in all his glory. When we are finally introduced to Luke and Leia the same feeling of nostalgia kicks in, everything from dialogue to artwork and even the way each frame sat together made this comic feel like Star Wars from the off. Although the comic is based during the original trilogy era, we have some small but great call backs to the prequel era especially The Clone Wars. The first of these comes when Luke discovers the imprisoned slaves, these slaves are being used to keep the factory working day and night, and consist of many aliens first introduced in The Clone Wars, including Dathomirian Zabrak’s and a Torgruta. The most interesting part of this is it shows parts of Darth Sidious’s plan to incorporate slavery into his Sith Empire, plan’s that he first mentions to Count Dooku during the Kadavo slaver arc of The Clone Wars. Whether this was intentional or not it really shows the cold-blooded brutality of the Empire. This bring’s me to my favorite moment of the comic, the ending! As the Rebels begin to make their escape aboard an AT-AT, they realize Luke is missing. Luke has felt a disturbance in the Force , he senses Vader’s presence and goes to confront him. With Luke’s confidence and anger taking over him Obi-Wan can only warn him from the netherworld. However in the last frame of the comic we see Darth Vader and Luke preparing to fight, and Obi-Wan merely saying “Run”. Star Wars #1 is brilliant. Jason Aaron and John Cassady have done such an awesome job of reintroducing us to our original heroes and villains. With fun and humorous dialogue, and very movie accurate artwork. This comic series is going to be a real hit! For someone like me who’s never been a huge comic book fan, this issue has definitely made an impact on me, I felt like I was back in the Star Wars galaxy once again, and I loved it! 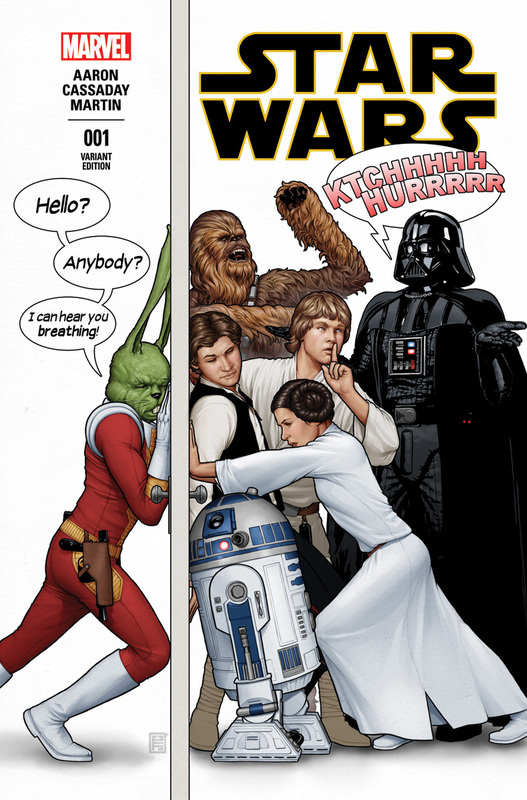 Pick up Marvel’s Star Wars #1 in all good comic book stores now!